So, let’s say you’ve got the urge to make a few festive treats this week, but you have no desire to deal with long lists of baking ingredients, flour-covered kitchens, or a hot oven. I’ve got two perfect solutions for you. First, we’ve got Chocolate-Covered Spiders. I know. They hardly sound festive, at least not for this time of year. Perhaps Halloween is a more appropriate time of year for these little goodies. But in my family, they were always made at Christmastime. I’ve actually already shared this recipe once before, during my Christmas in July celebration. 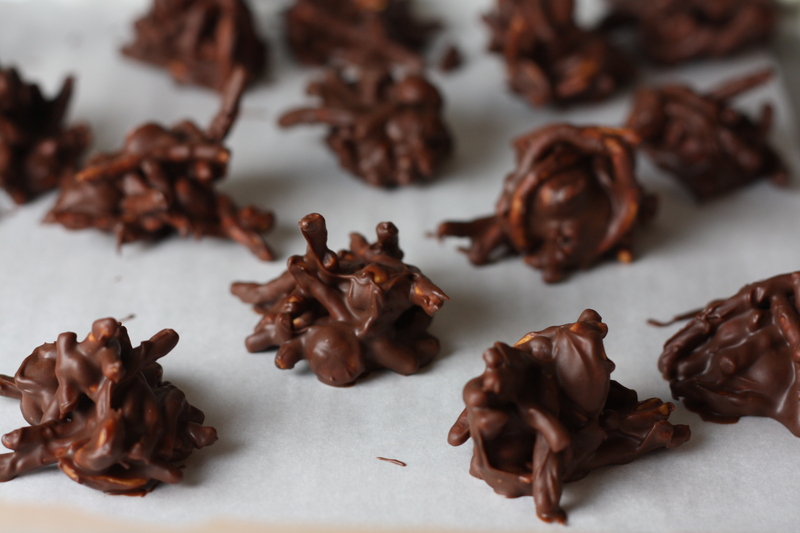 Since the holidays are actually upon us, it seems fitting to revisit these chocolatey treats. Line a few baking sheets with parchment or wax paper. Melt the chocolate and butterscotch chips in a double boiler or in the microwave, stirring frequently. Fold in the chow mein noodles and peanuts until they are well coated in chocolate. Drop spoonfuls of the mixture onto the wax paper. Refrigerate for 1-2 hours, until the chocolate has hardened. 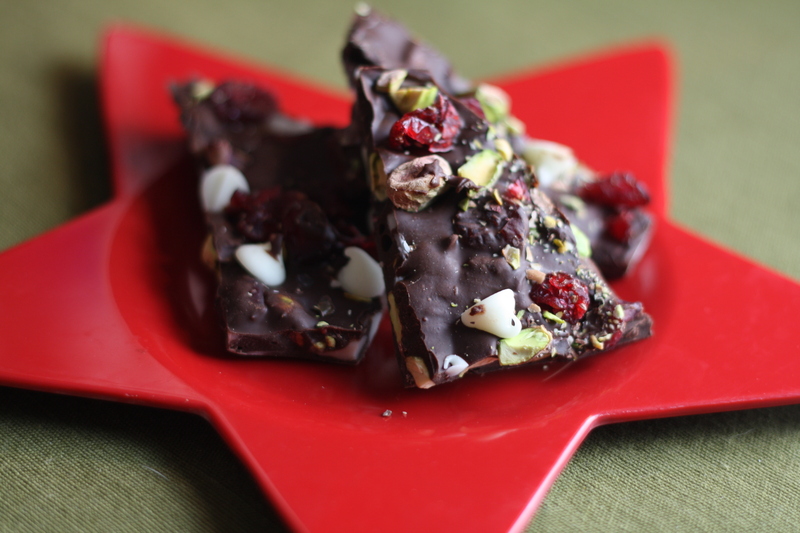 Second, we’ve got holiday bark. Bark is one of those super-simple ideas with infinite variations. Use any kind of chocolate (or combination of chocolates) and mix with any kind of nuts, fruits, candies, etc. Simply melt your chocolate of choice, mix in your desired filling, spread into a pan, chill, and break. So, have fun with this ‘recipe’ and adapt it to your personal preferences. 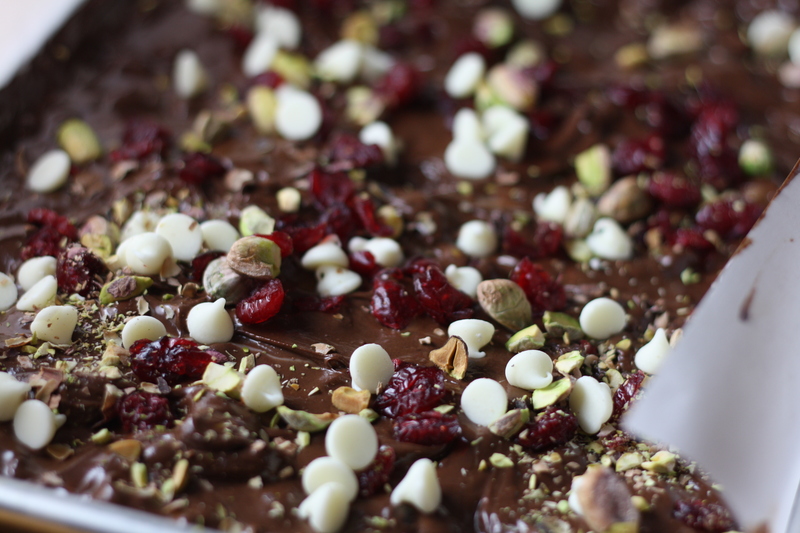 I went with deep, dark chocolate, mixed with pistachios, dried cranberries, and white chocolate chips for a festive green, red, and white effect. *Substitute any kind of chocolate or fillings you desire. Line a baking sheet with parchment paper. Melt the chocolate in the microwave or in a double boiler. Stir in most of the nuts, cranberries, and white chocolate chips. Spread the mixture in a thin layer on the prepared pan. 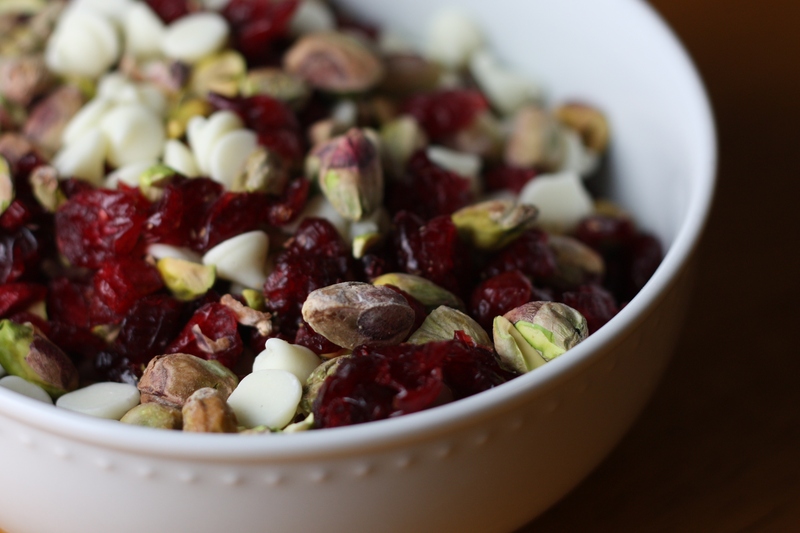 Sprinkle the remaining nuts, cranberries, and chips on top. Chill until firm. Break into pieces. 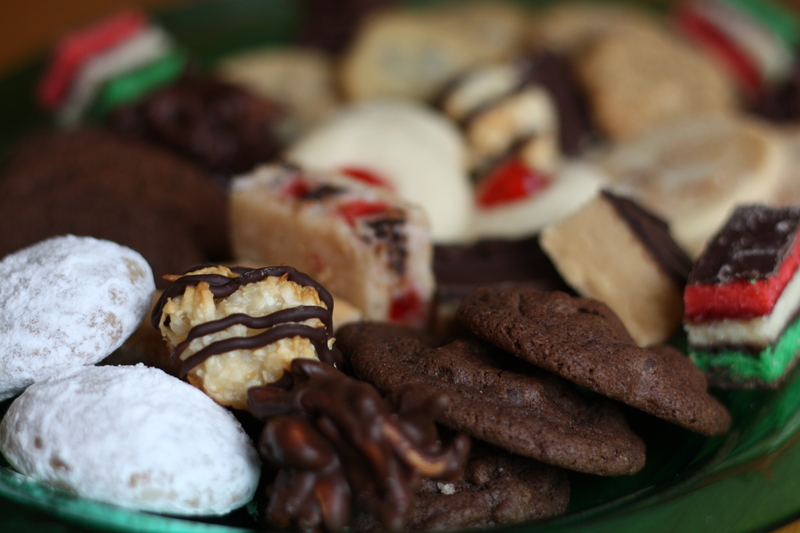 My cookie collection has been completed and cookie platters and tins have been arranged for gifting. 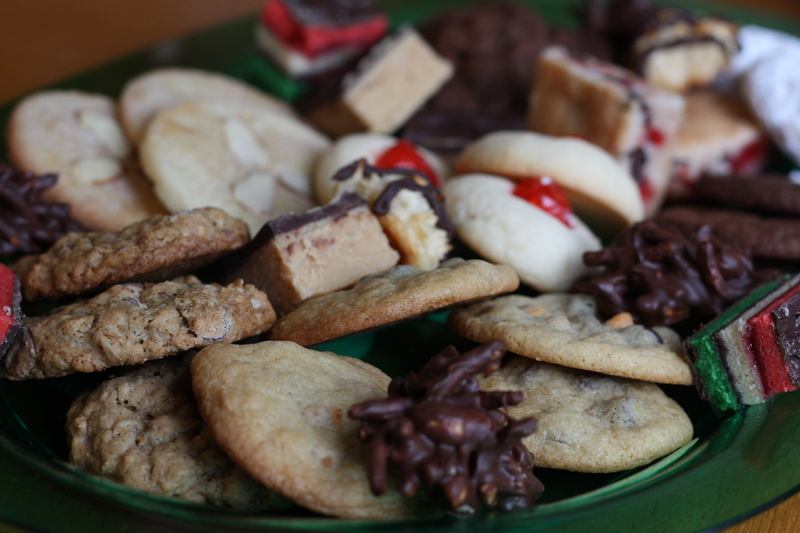 Stay tuned for two more cookie recipes and a few holiday menu ideas, coming up this week! Posted in Baking, Chocolate, Desserts, Food, Recipes and tagged baking, Cooking, family, Food, food photography, holidays, Recipes. Bookmark the permalink. What fun treats for the holidays. I tried the Spider recipe last night and it was easy AND delicious! That one’s a keeper! I love the bark, the colors are great and I bet it tastes even better than it looks!